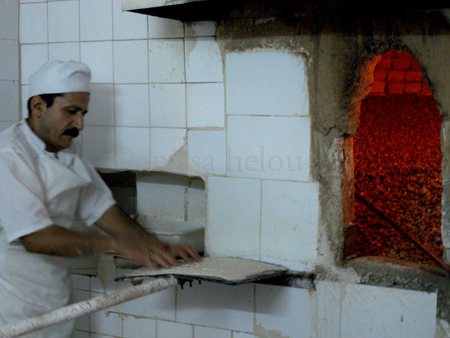 And here is my favourite of all Iranian breads, sangak, a large and very thin loaf that is pointed at one end and square at the other mainly because of the way the baker stretches the very wet dough as he lays it on the floor of the oven which is covered with hot pebbles. You often find sangak bakeries attached to restaurants, either dizi or simply kebabs like in this post about such a place in Dubai — there is an important Iranian community in Dubai and as a result great Iranian food. The bakery in my pictures is in Tehran, at the back of a wonderful dizi restaurant where the owner stopped looking at fashion in the late 60’s, early 70’s. He was dressed in a white and black suit with flared trousers and wore a hat. Quite unexpected in a place where everyone looks rather drab (on the street) because the women have to cover their hair and hips and most men are in grey or dark suits. Sadly, I didn’t photograph him and I didn’t take a clip of the bread making when he took us to the back to show us the bakery section but Press TV did and even though their clip is rather boring not to mention the hideous fake Persepolis-like set, it gives you an idea of how the bread is made. And you can read more about it in my Saveur article when they put it online. I wonder if there is anywhere in London where one could have sangak bread. I doubt it somehow! twelve years ago, when I was living in London, I often went to a very unassuming albeit quite famous tiny place where they server what they called “persian organic” food. I can’t say if it was a true sangak, however after many years I still remember this this bread served with a gorgeous mix of fresh herbs and meat of your liking. From what I could see from Google street view it’s still open and is named Patogh, located in Crawford Place. It was a place for low budget, but I found the meal always delicious, so you may want to give a try. PS: I own a little wood oven and one of the outstanding to-dos since a long time is to go gather some pebbles in the river and try to make “real” sangak 😉 If I ever succeed, I’ll tell you. the video is really good! 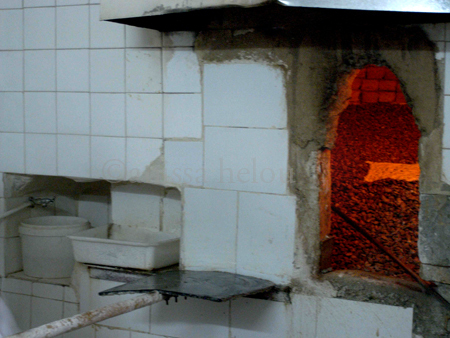 Most likely what I ate was lavash bread, not sangak, but if you go there you can ask them if anyone does sangak. Oh God. That video backdrop is hideous. But at least it taught me that lavash is Iranian, never realized that. One thing I don’t undestand is if the paddle where they place sangak is greased because that highly hydrated dough is very sticky, so how come that they drop it easily inside the oven? From what I see hydration must be between 70% and 80%. In the video he doesn’t mention the use of yeast in sangak or do you think he just assumed some yeast would be used anyway? last Sunday I made my first sangak! Well, I still need to figure out how to make the dough detach perfectly from the paddle like in the video, that’s more challenging than expected. As far as I could see it doesn’t seem to be a question of water or oil on the paddle, it must be something else, may be 70% hydration instead of 80% or something like that. Apart from the “stickiness” problems, the flavor is fantastic, it’s amazing to see how different tastes the bread made on the pebbles, it was sooo good! some dough remained on the peel, however I managed to get the most layered on the hot pebbles. I did some research on the web after posting my last message and it turns out that various people suggest to grease hands and peel with peanut’s oil. I used olive oil which can be more dense than peanut oil, so I’ll give a try with that the next time. When I’ll get a nearly perfect sangak, I’ll put the recipe and pictures on the blog. living in Iran for almost 50 years.